My recent contemplation of stoicism has led inevitably to a consideration of nihilism. Stoicism tells us that anything over which we do not have complete control is irrelevant – that is everything apart from our own virtues and vices. So anything done by other people is irrelevant. That is nearly everything that most people are concerned about. While following a stoical lifestyle increases your serenity and decreases stress, you inevitably wonder if it leaves enough in life to keep it interesting. Nihilism is a short step beyond that. You wonder if anything is relevant at all. Our own virtues and vices are only of interest to us and so what do they matter in the great scheme of things? Is anything you do of any relevance? After you go all that you are and have done will return to dust. Shortly after that your kids and grandkids will return to dust and with them your memory. Therefore you wonder if anything is worth worrying about at all. The Galaxy Song from the end of Monty Python’s Meaning of Life comes to mind. So what is the meaning of your life or anyone else’s? It has been said that I think too much and I feel I may well be overthinking this point. Many people commit suicide. Maybe some of them overthink life and come to the same conclusion. What do less intelligent creature than humans do? Cows graze, chew the cud, rest on the grass and walk slowly to the milking parlour. Your dog will at times run around life a mad lunatic maybe chasing rabbits. He will scrounge for food and at times lie resting in the sun. Creatures do what it is in their nature to do. This is a good guidance to what you should do. I thought of all the great things done by so many people in the past. Much of this work has served to make the world a much more liveable place. There are great works of engineering, of art, of literature, of business. These works make the world better. In some cases the creators are remembered well. In others their memory is their work. If all these people had not done what they did the world would be a lesser place. The key to life comes back again to the words of the philosopher king, Roman Emperor Marcus Aurelius – Get up every morning as early as you can and do what it is your nature to do. This could be anything, but by doing whatever is in your nature it will make you happier and more content with life and ultimately will make the world a better place. But the question that many people need an answer is what is it in your nature to do? Ask yourself what feels right? When I wake up this morning what do I feel I should be doing? You probably already do it for at least some time. One tip I read recently from a blog writer called Robert D is that you always know what you should do next. Ask yourself hypothetically what you should do next if you didn’t know what to do. Think about it for 15 seconds. You will answer the question and you should do that next. The 2 most important questions are 1. What is important right now? 2. What is important immediately after that? Again do not overthink it. This task is what is in your nature to do next. Thought of it? … Think on… Whatever it is feels right. Now there are other things you have to do. Think about ways of not spending so much time doing these tasks so you have more time to do what is in your nature. If you are fortunate it will be something that other people will pay you to do. 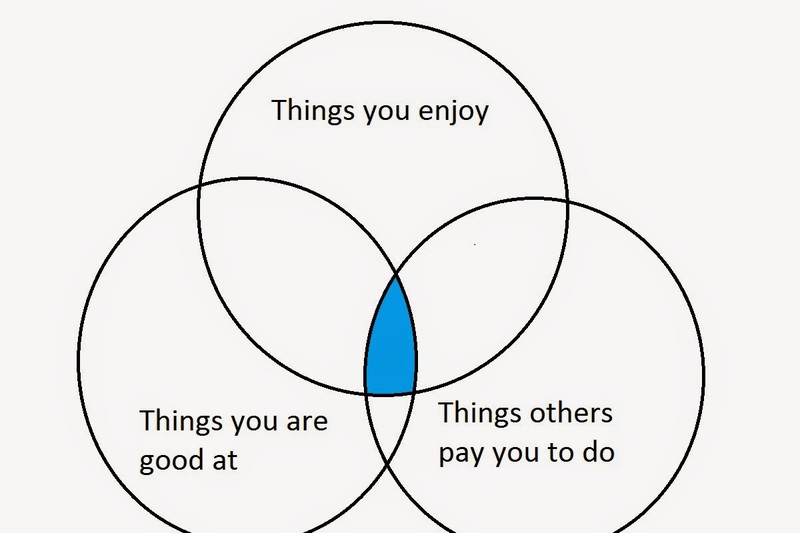 I read recently in another blog by Mike Figliuolo’s that to plan your career you should identify the tasks on the Venn diagram intersection of the sets ‘the things you enjoy’, ‘the things you are good at’, ‘the things people will pay you to do’. Anything in this intersection should make a good career. There is a good possibility that you will be able to make a good living if your can do something well and with great enthusiasm. But if you are having difficulty identifying something in the sweet spot, do not despair. There may be nothing that people are willing to pay you for that falls into the other 2 categories. But some people have achieved great things without means. We all know of penniless artists and authors who were only discovered after their deaths. But they could not have made their great works if it were not in their nature. For your own happiness you need to do what is in your nature – things you enjoy and are good at. You need to have faith that you will survive. Our basic needs are quite meagre if you are willing to give up luxuries. You may be fortunate enough to live in a country with a welfare blanket. You may be supported by your spouse or family. You should go for it. Do not feel guilty. You are doing what is in your nature. It may be in the nature of these others to support you doing it. If you are producing good work, I suspect these others enjoy supporting you. So now ignore all the responsibilities you feel are holding you back. Ask yourself again ‘what is it that it is my nature to do?’. Identify it. Once you decide to do it, you will think of ways to hand the responsibilities to someone else. If you want do something you will find a way. If you don’t want to do something you will find an excuse. A quote by Hugh Hefner ‘Life is too short to be living someone else’s dream’. What is it that it is in your nature to do?